Kudos to KPD’s Peter Bowers for Participating in “Chalk the Police” Day! 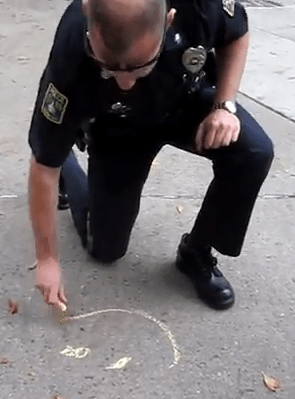 Keene Police officer Peter Bowers won some major cool points today in downtown Keene when he drew a smiley face with activist-provided chalk, as part of “Chalk the Police” day, a nationwide event sponsored by CopBlock.org! Video below. Even more interesting, Bowers did so after having been called to the square by the head of the parks and recreation department, who was complaining and trying to tell the liberty-loving chalkers to stop chalking, that we weren’t allowed, etc. The parks and rec “director”, Andy Bohannon, stopped his van in the left lane at the traffic light on the West side of Central Sq. and got out to harass the chalkers, blocking traffic for at least ten minutes. He ironically claimed that people were complaining, but talk about being a public nuisance – HE was the one actually bothering people with his van blocking an entire turn lane! Bohannon informs us that he’s called the police, and several minutes later they arrive and talk to him as we had run out of places to chalk on Central Sq. and had moved in front of city hall. The officers walk away from Bohannon and through the park where we encountered them as they were walking toward city hall, in front of Bank of America, where we told them it was Chalk the Police day and invited them to join in the fun. Oh, and Andy Bohannon, next time you want to come threaten us, at least take the time to park your vehicle properly like the rest of us! If anyone upset the people of Keene today it was you with your inconsiderate behavior. 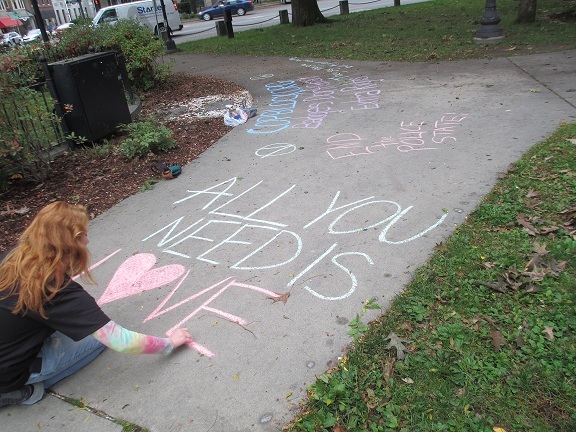 By the way, Andy Bohannon did not threaten the little girl who was randomly in the park with her dad and had also joined in the chalking, making it clear his problem was with the people/message rather than the act. Maybe next year we should re-name the event “Chalk with the Police Day” and invite the whole department! Here’s more coverage of the event at CopBlock from Kate, including more pics. Ian let’s do a semi-annual Chalk With the Police Day on April 1st, 6 months after/before National Chalk the Police Day! Plus it is April Fool’s Day! Progress seems slow at times, but there is progress. Thank You Free State Project and all the individual activists. Don’t hit. Don’t steal. Don’t lie. What a bunch of phonies!!! This is a two year old photograph!!!! Again, FK spins a lie to all you outsiders who think they are doing something good for your cause… ok call me a hater, but it’s the less you perpetuate thatcreate the seemingly ,”hater groups” I actually feel bad for those who believe in Free Keene, cause it’s all a false front… to pull in donations for free money, so employment is not required….